Tiger Woods stormed through Sunday with a final round 8-under 62, his lowest ever final round in his career. Woods finished in second place, just two shots behind McIlroy. Woods keeps saying that he is close, and the media scrutinizes every little detail about his golf game. And while he didn’t get the win on Sunday, there is no doubt that Woods is just about there with his golf game. Now, it’s about putting it all together for the whole week. But this week, the oddsmakers were spot on from the start, when they installed McIlroy as the overall favorite prior to the start. McIlroy remained the betting favorite throughout the course of each round on the revised PGA Tour odds at Bovada Sportsbook, and entering Sunday was a 4/9 favorite. The two-shot victory left no doubt as to who the No.1 player in the world is today. 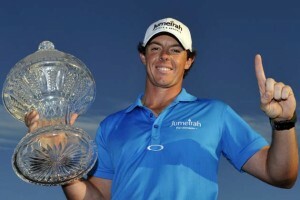 Sorry Luke Donald, but McIlroy has been coming for you for quite some time, and the future star of golf, and no doubt the best player in the world right now is where he belongs. But you can bet that Woods will be coming for McIlroy over the course of the next month, beginning in Miami this week at Doral for the World Golf Championships event. The betting odds for that event are not out yet, but Woods has won on this course six of 11 times he has player. So one can make a guess that Woods will be the overall favorite alone, who tied with McIlroy and maybe Phil Mickelson. All of the top-50 players in will be playing this week, which should make for a very entertaining tournament in a year that has been great for golf.